Fiona Stanley Hospital has 3600 parking bays (a mix of undercover and open air) available for patients, visitors, staff and volunteers. Car parks are located at both the eastern and western ends of the hospital. Paid parking is available for visitors and patients in visitor car parks 1, 2 and 5. Car parks 1 and 2 provide best access to the main hospital and car park 5 provides direct access to the State Rehabilitation Service via a footbridge on level 2, and can also be used to access the main hospital. Parking is charged at a rate of $3 per hour (or part thereof), capped at a maximum of $21.00 per day. Motorbike parking bays are located in car park 1 only. 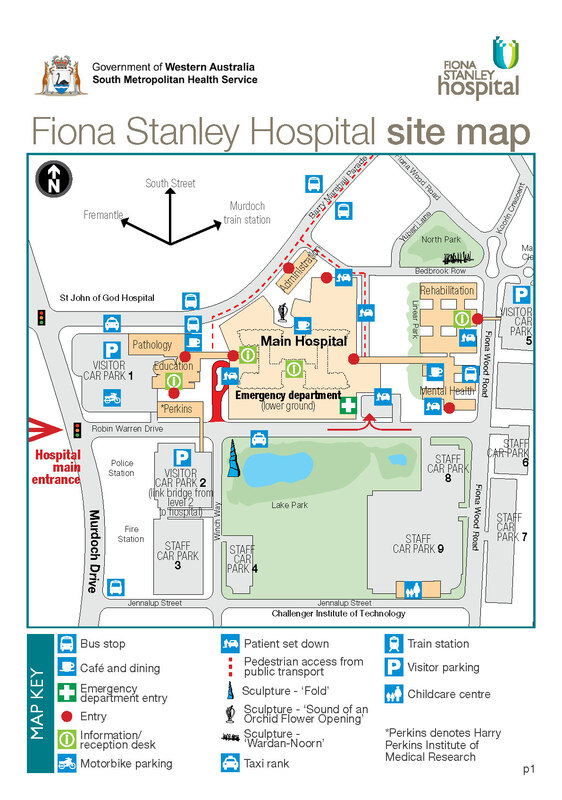 Use our hospital site map to locate our car parks. Read the Health Services (Conduct and Traffic) Regulations 2016 (PDF 214KB) for information on traffic control, parking and infringement notices. All street parking in and around the hospital site is managed by the City of Melville, please adhere to parking signs. Patients who are required to attend Fiona Stanley Hospital over a prolonged period of time for the same treatment may be eligible for subsidised parking. Hyperbaric, renal, cancer services and cystic fibrosis patients who have explored all alternate means of transport may be assessed for eligibility for subsidised parking. Patients approved for the subsidy will receive discounted parking. Speak to the treating nursing staff for further details. Some concessions apply for the families and carers of long-stay rehabilitation patients who are in hospital for 10 days or more at the State Rehabilitation Service (SRS). For further information, please speak to the ward staff. ACROD parking bays can be found in every car park and are located closest to the pedestrian access ways. Please follow the disabled access signs to access the hospital. Parking for oversized vehicles (higher than 2.2 metres) is available to State Rehabilitation Service patients and visitors on request in car park 8. Car park 8 is located off Robin Warren Road close to the rehabilitation facility. Please contact staff at the State Rehabilitation Service before you arrive at the hospital to arrange for access into the car park.